Tried straightening the picture up a bit to see if it would help but I'm still none the wiser. Given that this is a slide and the detail should be pretty good I suggest we need a better scan. I have a Nikon LS 50 ED film scanner which has a resolution of 4000 dpi. If we rescanned the slide we may be able to read the street signs or get other clues. Smart Alex - why don't you pass the original slide on to me next time we meet up? That's definitely NOT Duke Street at Bellgrove Street. james73 wrote: That's definitely NOT Duke Street at Bellgrove Street. Cos Annbank Street is just beyond the junction, and it's not shown on that picture. james73 wrote: Cos Annbank Street is just beyond the junction, and it's not shown on that picture. 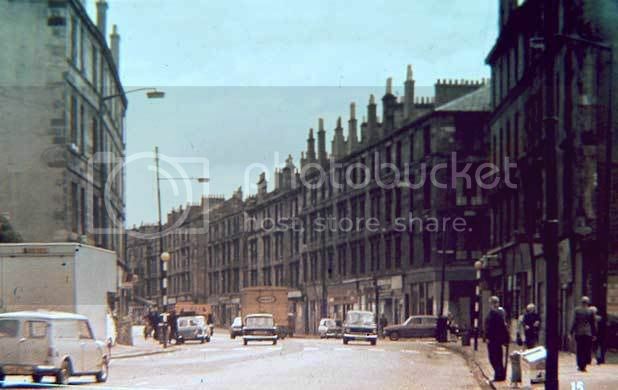 Maybe it's Duke St, looking East from the top of Annbank st. Then that street on the right is Sword St. Does look like it. How about the bottom of Prospecthill looking south???? Duke St doesn't bend that way ( so to speak...) if you're standing at Annbank Street. Iv'e looked at it from the Bellgrove and Annbank St and it definitely Not Duke Street for one as James73 Said the road bends the wrong way Duke Street bend slightly to the right and is not as severe a bend as the on in the slide. DVF wrote: Tried straightening the picture up a bit to see if it would help but I'm still none the wiser. Nice Work DVF, Cheers for that. JohnR wrote: Smart Alex - why don't you pass the original slide on to me next time we meet up? Thanks John will bring it to the next meet. As for Byres Road and Parliamentary Street and the others I'm not sure of the areas but a recent pic would sort this mess right out. Smartalex wrote: Iv'e looked at it from the Bellgrove and Annbank St and it definitely Not Duke Street for one as James73 Said the road bends the wrong way Duke Street bend slightly to the right and is not as severe a bend as the on in the slide. Whilst I can but curtsey in the direction of your superior East-endedness, it still looks like the view from the Duke Street entrance of the Meat Market to me. Kindly disabuse me of this notion, A . Unless the street no longer exists. HollowHorn wrote: Unless the street no longer exists.